Aptly known as the ‘Pearl of the Indian Ocean’, Sri Lanka with a population of 20 million population, is rich in its heritage, natural beauty and an abundance of magical treasures offering truly sensational holiday experiences. Whatever your interests are you can be sure that Sri Lanka will satisfy your dream holiday exceeding your expectations. 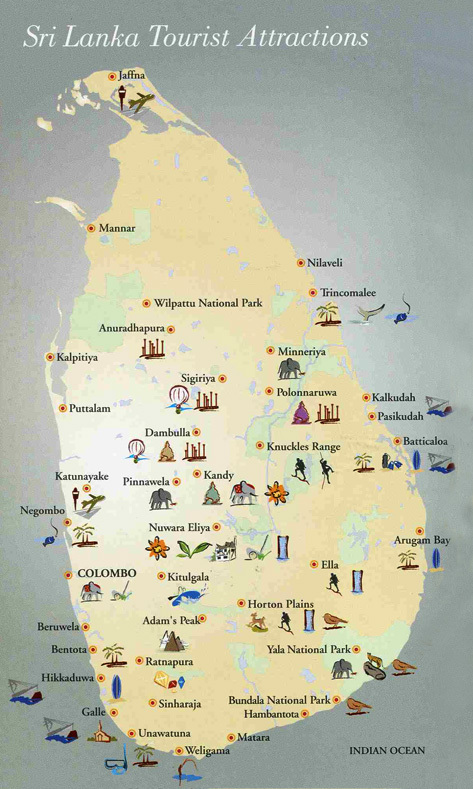 Sri Lanka’s history is rich and spans over 2500 years leaving a legacy of a multi-ethnic country. Banished Indian princes, spice traders from the Arabian Peninsula and South India together with Portuguese, Dutch and British settlements have not only left behind marks on the gene pool of Sri Lankan natives, but also nostalgic remains of architecture in buildings as well as a twist to the language, life style and food. Although different ethnicities within Sri Lanka have developed different sub-cultures, every Sri Lankan irrespective of creed or ethnicity, is ingrained with a sense of warm hospitality. The Native history is evident with its remarkable architecture and is amply reflected in Buddhist temples and monuments. Traditionally referred to as ‘Raja Rata’, or the ‘King’s Land’, but more popularly known as the ‘Cultural Triangle’ today, will enthrall the curiosity of all visitors. The grandiose monuments centred in the great ruined cities of Anuradhapura and Polonnaruwa still serve as potent reminders of the golden age of the island’s civilisation. These ancient capitals (Prior to the contemporary capital of Colombo), regarded as some of Asia’s great metropolises, are dotted with vast monasteries, elaborate palaces and monuments celebrate the beauty and splendour of Sri Lanka’s rich history. To name just a few of the historical sites, the magical Treasure Box of Buddhist sculptures with its hundreds of Buddha statues carved in virgin rock in the marvelous cave temple in Dambulla is truly magical. Visitors should not miss the chance to climb the spectacular rock citadel of Sigiriya, with its world-famous rock paintings of ‘Damsels’ known as Sigiriya Frescoes. Many more wonders await you!! The National Geographic states that ‘Sri Lanka is home to the World’s best beaches a washed with pristine aquamarine waves and eternal sunshine’. The coastal belt of the island boasts of an infinite stretch of golden sandy beaches framed by a fringe of coconut palms providing a picture-postcard setting. Opportunities for swimming, white water rafting, wind surfing, water skiing and surfing are endless. As described in Lonely Planet, Sri Lanka’s Hill Country is the Island’s most scenic – a mist-wrapped land of emerald peaks and stupendous views of hillsides carpeted with tea plantations and graced by astonishing crystal-clear water falls. The climate in the hill country is cool and crisp compared to the rest if the country, where one can wear a light jumper during the day and snuggle up beside a log fire in the evening sipping a cup of the most flavoursome and world-renowned tea (Ceylon tea) or a glass of wine. You could combine a Walk to the End of the World at stunningly beautiful Ella, watch the magical sunrise at Adam’s Peak, or simply paddle a boat down a raging river bewitched by the breathtaking vistas. Visit the Temple of the Tooth in Kandy and enjoy the drum beat of traditional dance or simply savour the silence on a lonely mountain top! Visit to a Spice Garden is another attraction. The choice is yours. For such a small country, Sri Lanka has a remarkable mix of nature. Thanks to its amazing tropical climatic conditions, it has a vast and diverse array of eco-systems ranging from breathtaking misty Grasslands to awesome mountains in the hill country to the splendour of monsoon rainforests and forests in the dry zone offering a diversity of nature and giving rise to a richness of species. For example, this tiny island boasts of 4,000 species of flowering plants, 244 species of butterflies, 82 of freshwater fishes, more than 106 species of amphibians, 171 reptiles, 482 bird species and 92 of land mammals. In addition to such diversity, richness of Sri Lanka’s nature is largely endemic thus very precious and significant worldwide. Sri Lanka offers one of the finest wildlife and nature reserves in South East Asia. You can be enthralled by the sights of great elephants, enormous Whales, elusive leopards, schools of dolphins and hundreds of species of colourful birds as well as reefs brimming with rainbow coloured fish and coral reefs. The impressive array of national parks, protected zones and safari options allow any traveler from a dedicated naturalist to a lay person to make the most out of the splendour of Sri Lankan wilderness. There are many opportunities for shopping whether looking for keepsakes, crafts, jewelry or antiques. Shopping for gems is popular. You can find finished pieces of gem-studded jewelry or gem stones at very reasonable prices. Hand-made Batiks and hand-made wood sculptures are unique as Sri Lankan souvenirs. Sri Lankan passion for food is reflected through the wide variety of authentic dishes prepared with the freshest of vegetables, fruit, seafood, meats and game. Hotels and Restaurants offer International, Western and Asian dishes in addition to authentic Sri Lankan delicacies. Modern take away outlets cater for all tastes at modest prices. Travellers are spoilt for choice whether to pamper oneself in luxurious 5-star or Boutique accommodation or modest 3-4 star rated accommodation. Whatever the choice, one will undoubtedly experience the warm hospitality Sri Lanka is renowned for. If one choses to experience Ayurvedic treatment, there is no better place than Sri Lanka. A wide range of hotels offer Ayurvedic spas and treatments believed to have amazing healing powers as well as to attain mind and body equilibrium.